Propane proves its value as one of the most versatile energy sources on the planet. From heating your entire home to powering appliances like the kitchen stove or water heater, its uses are nearly endless. Homeowners and business owners choose propane to power their lives because of its reputation for affordability, efficiency, and convenience. 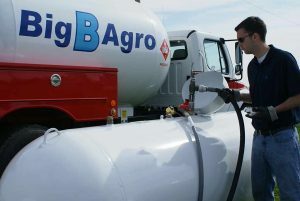 At Big B Agro, we are proud to deliver this superfuel to homes and businesses in our Greater Decatur, IL, service area and across Central Illinois. Learn more below about our propane delivery and services. Central Illinois homeowners count on Big B Agro to deliver top-quality fuel at the fairest prices in the area. When you choose Big B Agro as your local propane provider, you can always expect your delivery on time, every time. If you live within our service area, contact us to learn more about convenient delivery and payment options! Big B Agro understands the hard work it takes to run a farming operation in Central Illinois. That is why we aim to make it easy for farmers to keep all wheels turning with the help of efficient, affordable propane. We are pleased to serve the agricultural businesses in our community with dependable delivery services. When it comes to your propane equipment, you can trust your system is in good hands with Big B Agro. Our service team is highly trained to diagnose and repair a variety of technical issues. Whether your tank needs a checkup or your system is malfunctioning, we’re prepared to quickly remedy the situation day or night.